Mark Who? (Versatile Blogger Award) | Mark Rickerby's blog AND (insert trumpets here) God's Sitcom – Messin' with Mark! I’m so new to blogging, I didn’t even know blogger awards existed, so it was a surprise and an honor when I received a message from Kathrin S. at https://mycupofenglishtea.wordpress.com letting me know she had nominated me. Thanks, Kathrin! I started this blog a few years ago but didn’t really commit to it until recently. Now that I’m in the habit of writing every day, I’m starting to see what all the fuss is about. It’s a great outlet and healthy to get stuff out of our systems regularly, whether venting or celebrating. I’m Mark Rickerby. I’ve been married for ten years and have two daughters, 3 and 6 years old, who remind me constantly to stop writing about life and actually live. I’m pretty sure I learn more from them than they do from me. My life began when they were born. All the things that mattered to me so much before they came along don’t matter anymore. The desire to make them proud of me brings out my best and pushes me beyond the point where I stopped before. 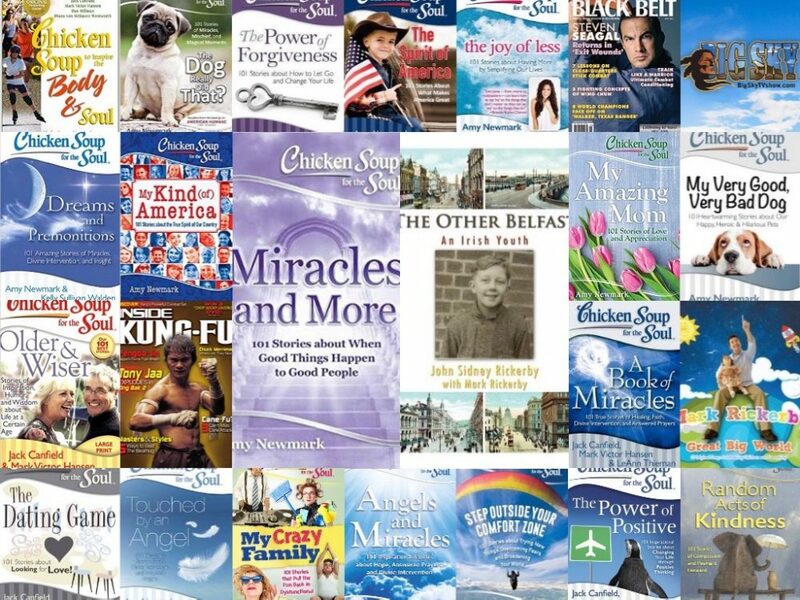 I’ve had stories published in 17 Chicken Soup for the Soul books and in magazines like Black Belt, Inside Kung Fu, Nostalgia and Whole Life Times, but it took me forever to trust myself as a writer. Paralysis by analysis and very little trust. I felt like I needed to read every book about writing before I could attempt anything serious. But as Dan Millman wrote, I finally accepted that we don’t need to know everything about the ocean in order to swim in it. I’m trusting the process, seeing where the path takes me, and enjoying life more than ever before. I spent a lot of time in my twenties traveling the world, to both seek adventure, of course, but also to figure out who I was, as cliche as that sounds. I must have been a young soul because I had no idea for a long time. So, I rode a camel and did a bunch of other distracting things until time and circumstances forced me to stop playing around, confront myself and do the friggin’ work already. He died in December of 2014 after five years with Parkinson’s Disease and Dementia. I’m still wrecked by it. I’m very happy during the day, but struggle with insomnia. My mind becomes a bad neighborhood at night sometimes, especially since and because of how my dad passed away. As if that weren’t enough, all the love letters he wrote to my mother when they were young were stolen by burglars shortly after he died. I have some dark thoughts about finding them and punishing them worse than the courts did, but I won’t because I don’t like the idea of my daughters seeing me in an orange prison jumpsuit. My main escape from the sadness and anger caused by the above events are writing and singing. If I didn’t have those outlets (and my wife and daughters), I would most certainly be insane right now. My favorite book is Zorba the Greek by Nikos Kazantzakis. Every sentence is a poem. The movie is pretty good, too. I’m the co-creator and head writer of a western TV show called Big Sky that I and the rest of the team are in the process of pitching to studios right now. I’ve been obsessed with it for years. I feel like I live there and the characters are all close friends of mine. We’re getting a lot of interest and weighing our options. I hope to make an announcement that the show has been picked up soon. I’m ridiculously nostalgic and, as a result, a little neurotic. Freud defined “neurotic” as “wanting the world and others to be as we are rather than as they are.” I have this persistent image in my mind of how the world should be and how people should treat each other, collected and stored deep in my psyche from old movies and TV shows set in places and times when people still had some expectations of each other. (The Andy Griffith Show chief among them.) I battle with it constantly because I know the world is full of people who refuse to accept things the way they are, and they are miserable to the degree that they don’t. It’s not only one of the main reasons for unhappiness, it’s the cause of war. The most extreme current example would be ISIS running around beheading everyone who doesn’t pray, think, dress and live exactly as they do. I just want to be friends with everyone and to see more kindness in the world, so disappointment is inevitable, especially on L.A. freeways. I revel in and love nature like a baby being cuddled by his mama. There’s nothing I love more than waking in a forest and feeling different consciousnesses greeting the day, especially flowers opening and turning toward the sun. How the heck do they know how to do that? I don’t care how science explains it, that’s thinking. One of the writings I’m most proud of is a poem called How We Survive that has traveled all over the internet in the twenty years since I wrote it. Every now and then, I Google it to see where it went, like checking to see what a child or old friend has been up to. It’s about the grieving process. I wrote it after my brother died. It has helped a lot of people struggling with grief feel a little better. What better thing can I do as a writer than that? I hope I didn’t get too maudlin there, but then, life is always a grab bag of ups and downs, isn’t it? The trick is to not let the downs make us forget the ups. Thanks for reading. Share seven (or more) facts about yourself. Nominations – In case anyone whose blog I’m following is wondering why I didn’t nominate them, it’s probably because you have a lot of followers already, or at least more than 300. I chose these people below because a) I like the way they write for some reason, and b) their blogs are new and in need of readers like mine. Thanks! I’ll be happy to participate.